Walking through Mumbai’s streets, one experiences a live blend of local culture and traditions. Roads are shared between cars, buses, rickshaws, two-wheelers and pedestrians in a somewhat chaotic way. The traffic doesn’t seem to follow any rules. Sidewalks are there, fulfilling many functions, but no one uses them for walking. Mumbai’s pavement is a platform separated from traffic that accommodates many uses indeed. To street vendors they are their prime markets. At night the pavement becomes an open-air sleeping space to more than a million individuals. On some streets, tarps are spread out along whole stretches as protection from the monsoon. When pavement dwellers are chased away, which happens often, they have no other option than making a new home on another the sidewalk. Nevertheless, in some places newcomers have managed to settle down over longer periods of time. Year after year, tarps become more permanent structures; timber planks, corrugated metal sheeting and even bricks are assembled to form much more durable and lasting shelters. This phenomenon existed already a hundred years ago. All around the city and especially in the so-called Eastern Waterfront, workers servicing the port economy would stay along roads, on bridges, against mills and warehouses due to lack of affordable housing. They would live for decades as close as possible to their place of work and transform their ephemeral shelter into constructions that they could call home. In the context of our master thesis at the Swiss Federal Institute of Technology in Lausanne, we analysed two case studies on the Eastern Waterfront. On of them is the Elphinstone Estate. It is a 1km-long parcel of land, comprising 14 parallel streets of warehouses. The oldest warehouses date back to 1880. Along every street, the pavement is concealed by durable one or two storey high bricks or metallic sheet structures. Around 10’000 people share those sidewalks, some have been there for more than 70 years. Today, the municipality provides them with metered water and electricity but the entire estate is to be demolished within five years, due to the planned redevelopment of the area. 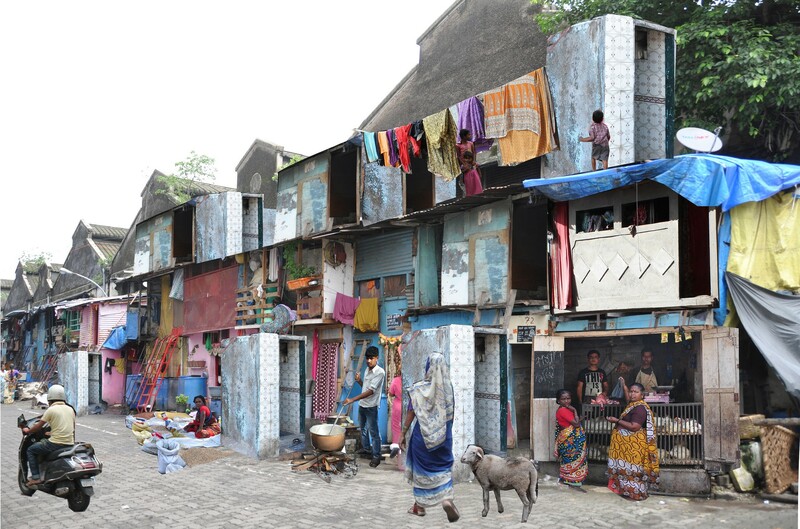 The communities are highly rooted in the neighbourhood, and a relocation would compromise their livelihoods while destroying a piece of Bombay’s history. Elphinstone Estate bears all the characteristics justifying a local intervention. Indeed, the whole area has been functioning as a sustainable ecology for a century, the warehouses and the dwellers mutually benefitting from one another – the warehouses as constructive structure and job provider, the dwellers as an indispensable workforce. While men’s activities range from loading-unloading trucks, to driving them to working in logistics; women cook for the workers, sell goods at the weekly market, and sometimes work as maids or even teachers. Even though pavement dwellers usually tend to stay at the bottom of the social ladder, the location and the longevity of the Elphinstone Estate community has allowed parents to send their children to good schools. Many second generation dwellers have realized the importance of education to secure better qualified jobs. Today, a few young people attend university, studying mostly business and commerce. Children have high aspirations, taking examples from their siblings and neighbours. For such a deeply rooted community forced displacement can have dramatic outcomes. Detractors talk about the ugly image given by pavement dwellers to the city. Policemen try to discourage foreigners from wandering about the area using adjectives such as unsafe, ugly or uninteresting. But when we talked to people living there, we heard very different things. Many of them know that they could live in more spacious homes further north, yet they would never abandon their street willingly. “Of course it is not the safest place to live but the street is our home too, inside, outside, we live the way we want here and we are close to everything” said Neha, a 20 years old university student. Indeed, it is precisely thanks to this typology of housing that a hybrid way of life combining rural and urban habits was preserved through generations. Until today, roosters crow at 6am everyday, and sheep give birth inside dwellings. Our project aims at discovering how the pavement dwelling typology can be further developed in the Elphinstone Estate – as an example for other suitable sites – for the benefit of the residents, and the city at large. The main issues we identified consist of a lack of security and privacy due to the dwelling’s direct relationship to the street, a general lack of resources, the need for new materials and technology for house upgrading, and unemployment which often leads to more social problems. The traffic has to be dealt with to decongestion the area and offer more security for all users of the street. The buffer zone between the street and the dwelling is naturally used by dwellers at all time. They use it to perform domestic activities, sell goods and sometimes sleep. Legitimizing that space and considering it part of the private space would be first steps into making these streets more ‘inclusive’. Construction-wise, houses would greatly gain from individual sanitation systems composed of rainwater collectors and stronger structures allowing the dwellings to grow in height and the roof to be inhabited at times. The site could be densified and house some pavement dwellers from other parts of the Eastern Waterfront who have no choice but to be relocated. Social issues can be addressed by the implementation of new programs that could include vocational training facilities allowing men and women to develop new skills, the implementation of sport facilities for young people, making additional storage spaces in the warehouses by building extra floors in order to maximize the efficiency of the Elphinstone Estate as well as providing more jobs. In order to put these upgrades in place, there should be meaningful participation from the pavement dwellers themselves, which would enhance not only economic and social development, but would embrace them as full and contributing members of society. Citywide implementation of these policies would generate a network of informed citizens, whose intimate knowledge of the challenges faced and conquered in these areas would provide an invaluable resource for policy makers and residents alike. Their inventiveness and resourcefulness shown in immensely difficult circumstances should be acknowledged and valued by the authorities for the wealth of human capital it represents. What is required is a fundamental change in mindset at governmental level, away from the erroneous conclusion that the only solution for ad hoc settlements is to destroy them. Instead, they must engage with those most knowledgeable about the potential these settlements have as long term solutions to help alleviate the global urban housing crisis, the dwellers themselves. Part one of this research project can be viewed here. Letitia Allemand and Marie Sagnières are masters students in Architecture at the Swiss Federal Institute of Technology in Lausanne. They have both completed a Minor in Area and Cultural Studies and wrote about informal settlements in various Asian contexts. After graduation, they are intending to pursue careers in development and cooperation.